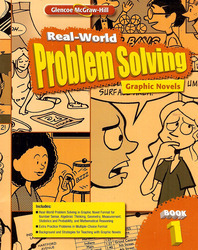 Glencoe/McGraw-Hill´s Real World Problem-Solving Graphic Novels, Books 1 -3, are a unique resource for teachers to reach all students. This workbook is designed for use in any classroom and with students of any ability. The Graphic Novel covers each mathematics strand of Number Sense, Algebraic Thinking, Geometry, Measurement, Statistics and Probability, and Mathematical Reasoning.